It’s day 3 of the 5-Day Fall Cleanse, which means we are past the halfway point. 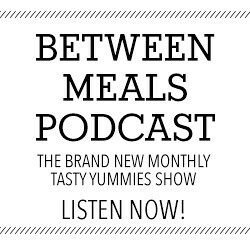 I hope you have been following along with Sherrie and I are on Facebook and Instagram pages (links below) where we are sharing every single thing we are eating. I actually wish I had it in my schedule to do this cleanse for longer, I am truly enjoying it. Since I don’t, that just means I will go forward eating more mindfully again, which is one of the main reasons I love a cleanse. It resets everything, it gets me back to being focused and aware, listing to my body and eating intuitively. It is the the best way for me, that I have found to stop bad habits in their tracks and get back to feeling my best. My favorite thing about a cleanse in the cooler months, is being able to make a huge pot of soup to enjoy throughout the cleanse. It makes mealtime easy and stress-free. It guarantees that I always have something healthy to choose from and it keeps me from making any crazy decisions. This particular soup is filled with the best of what is in season right now. If some of these ingredients aren’t available near you, improvise with what you do have. 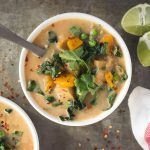 This soup was literally inspired by what we had left from our last CSA box (we get our next box later today) and what looked best at the market. I went with Aduki beans for a protein, as they are far easier to digest than most other legumes and they are known to help the liver to detoxify. 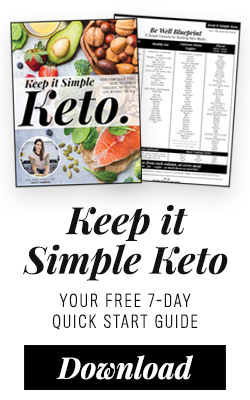 Just a quarter cup of azuki beans contains 100% of the recommended daily intake of molybdenum, a trace mineral that produces the enzyme sulfite oxidase which is crucial for liver detoxification. Azuki beans are one of the highest in protein and lowest in fat and they are loaded with soluble fiber. The high iron content also makes them a good choice for women’s health. In Japan, aduki bean soups are often consumed after menstruation to replenish red blood cells. 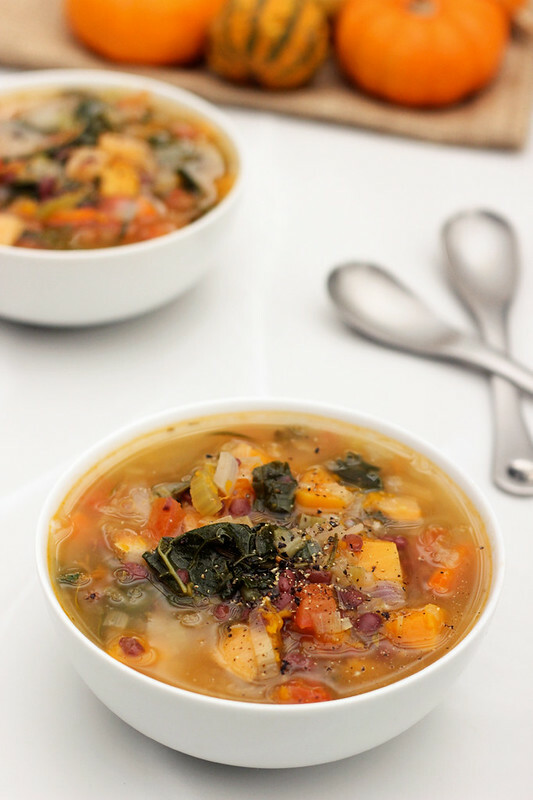 This soup is so comforting, so warming and really makes you feel good! I love the hint of flavor from the apple cider vinegar that I added at the end. You could also opt for lemon or lime juice instead. Feel free to use whatever fresh herbs you have on hand and enjoy. I had fresh oregano from the market and a huge rosemary bush in our yard. I feel like a broken record, since I literally say this on almost every recipe on my site, but please feel free to tweak this and make it your own. * I used dried beans that I cooked beforehand. Feel free to used canned, I personally avoid canned foods while I am cleansing. 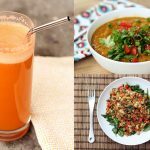 Feel free to substitute mung beans, lentils or even pinto beans or kidney beans. Just be sure to soak any beans than need soaking, before cooking them. Heat the oil in a large pot over medium-high heat. Add in the onion, leek, celery, pepper(s) and garlic. Cook for about 5 minutes, stirring often. Add in the carrots, rutabagas, cabbage, squash and any fresh herbs you are adding. Cook for about 5-7 minutes. Stirring often. Add the water, tomatoes and beans, take it up to a medium-high bring it to a light boil then drop the temperature down, cover and simmer the soup over a low heat for 30-45 minutes. The longer it simmers, the better and more intense the flavor will be. Season with salt and pepper, to taste. Add any additional herbs or spices you would like. 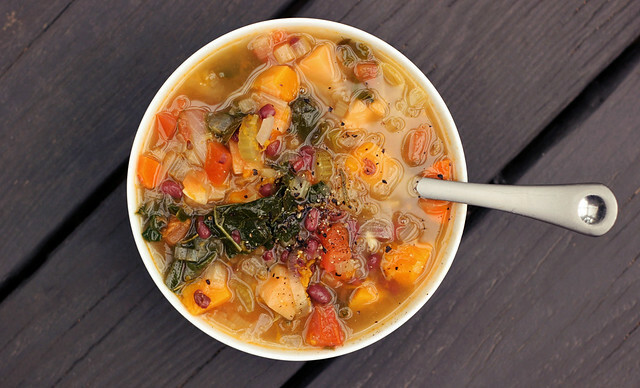 Looking for even more cleanse-friendly soup? 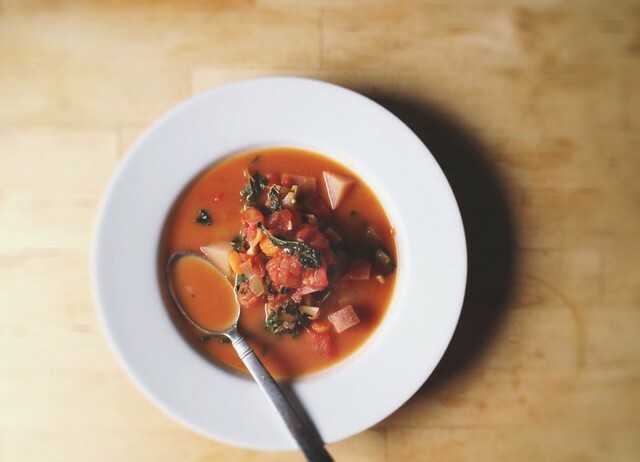 Head over to Sherrie’s site, With Food and Love, now and get the recipe for this comforting and cleanse-friendly Garlic + Fennel Minestrone. This is my kind of soup!! 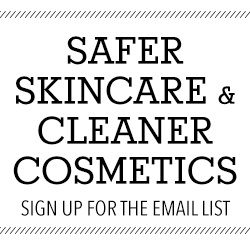 Make sure to follow along with us on our social media sites for more cleanse tips + details this week and for photos and recipes to the foods we’re eating. 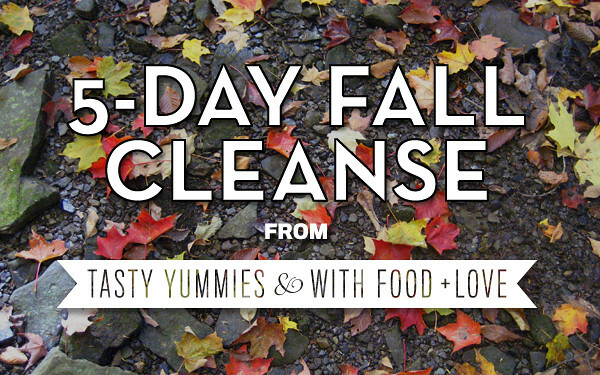 Hashtag #5dayfallcleanse if you share any photos, we’d love to see what you are eating! It really is. So full of wonderful flavors! Oh my gosh, this looks SO so good! 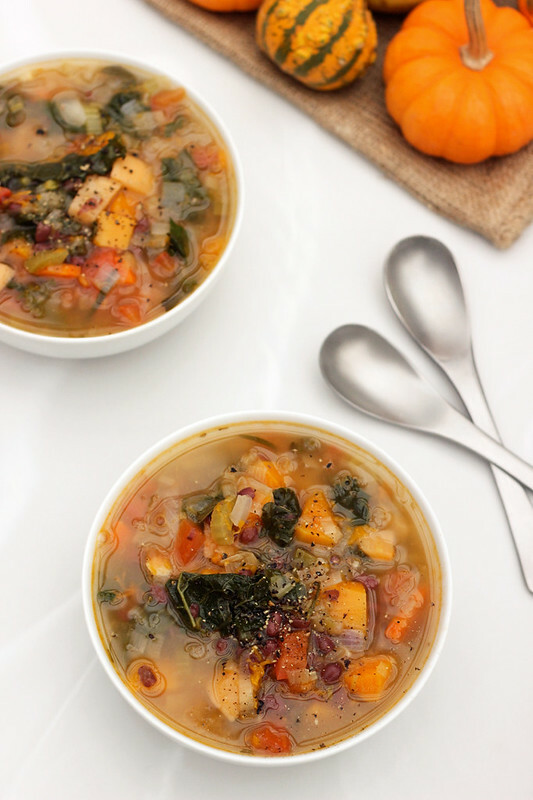 What a perfect fall soup! 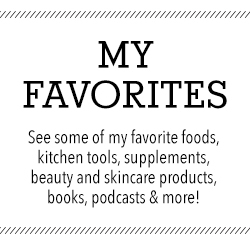 I love your 5 Day Cleanse series. 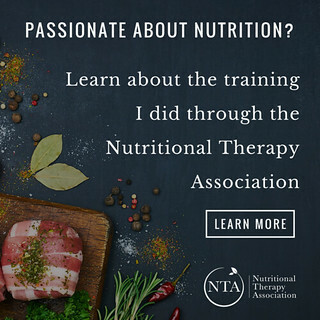 I’m following along and doing it with you (just not all the same recipes). Thanks for the motivation and the beautiful food! That’s awesome to hear Raechel. How are you feeling? Today I am feeling really great! I’m feeling great! Had one tiny headache, and a moment of feeling kind of drained in the morning, but otherwise, it feels great to go to bed every night and wake up every morning without that, “Ugh, I shouldn’t have eaten that” feeling! That’s THE best part of cleansing. No guilt, anywhere. I love it. I felt a tad tired on days 2 and 3 but wow yesterday, day 4 was great. I was full of energy! So glad you are following along with us! 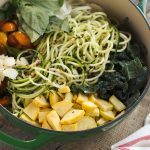 This recipe was just what I needed to use up the rest of the goodies from my CSA. It turned out perfectly. I love the added apple cider vinegar at the end, such a nice touch! Yay! I am so glad you could use this recipe and that you enjoyed it. Isn’t the ACV just the nicest little burst of flavor? I love adding it to soups! Beth! How many people do you think this batch would serve? Thank you for this recipe! I am going to use it to feed the Kundalini kids for our yoga at the beach party!!! Hi. I was looking for a creamy soup. Have you ever tried this blended? I have never blended this now. 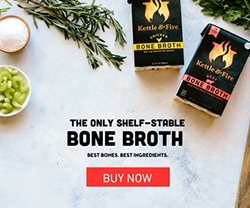 I am not sure I would, given the ingredients, I don’t think there would be much to thicken it or make it creamy, which I look for in a blended soup. But that’s just me personally. Thank you for this recipe! Made it tonight and it was so delicious. 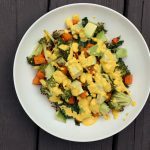 With it being mostly root veggies, I wasn’t sure that my husband and kids would like it, but they did….in fact, they REALLY liked it. As I follow a paleo lifestyle, I left out the beans and added some parsnip instead. So good! !